According to PC management services company Soluto, "in the field" testing has revealed an Apple-built laptop to be the number one performing Windows machine as of April 2013, despite not being optimized for the operating system. In its first ever report, Soluto (via CNET) looked at long term analysis of a "huge number" of PCs, gleaning data from application crashes, freezes, long boot-ups and other general computing slow-downs in what it called "frustration analytics," and found Apple's 13-inch MacBook Pro to be the best Windows laptop available. Along with taking the top spot, another Apple machine, the 15-inch Retina display MacBook Pro, came in at number six, behind PCs from Acer and Dell. Acer's $429 Aspire E1-571 came in second, while Dell's sub-$1000 XPS13 followed in third place. 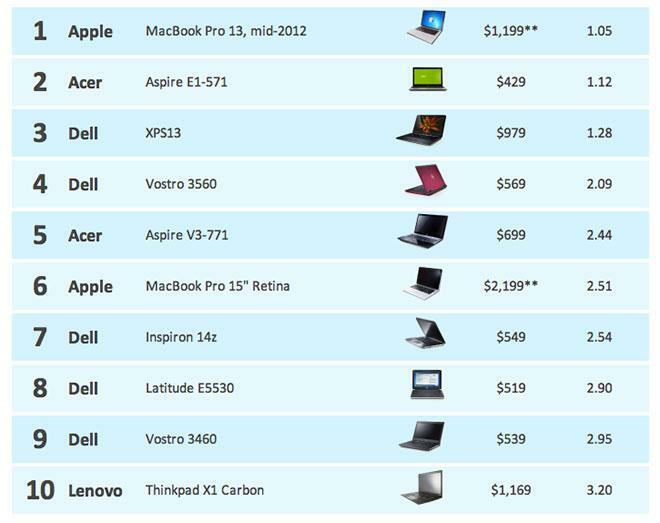 The MacBook Pro is the most expensive PC among the top 3, but if youre looking for top reliability - the data is clear. MacBook Pro is the best Windows PC on the market. The report notes that comparing a Windows install on a MacBook Pro with one from Acer or Dell is a bit unfair, as Apple's version is "clean," or devoid of bloatware usually pre-loaded by PC OEMs. The company points out that a future analysis will take this discrepancy into account, but for now the "frustration" data looks to highlight real life use, not lab testing. While nabbing first place, the 13-inch MacBook Pro did have some downsides, like the need to purchase and install Windows through Bootcamp or third-party PC virtualization software like Parallels. Also, the Mac's keyboard is not mapped specifically for Microsoft's OS and drivers could be an issue for some users. For its sample, the firm used data from 150,000 laptops over a three month period from January to April, analyzing "application crashes, application hangs, blue-screens-of-death, boot time and number of background processes" to generate a comparison that it says yields a "real user experience."